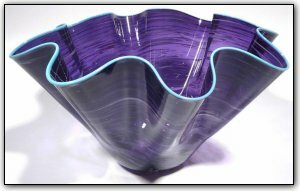 This purple fluted bowl features a baby blue lip wrap and a shape that is truly elegant. The artist also added a thin layer of white underneath the purple which creates a subtle white swirl mixed in with the various shades of deep and dark purple. The flutes are stunning and the contrast between the many shades of purple and the baby blue lipwrap is simply breathtaking.